In the shadow of Cairo's medieval aqueduct, Mohamed Mustafa teaches his 5-year-old son the Egyptian family's trade, one shear at a time. Mohamed is one of Cairo's donkey barbers, an expert in trimming and styling horses, camels, mules, sheep, goats, dogs and donkeys. He is a third-generation qassasseen. 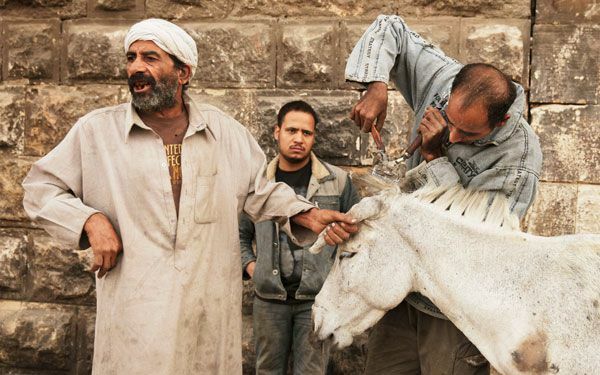 That is the Egyptian Arabic term for animal barbers. Mohamed's grandfather worked in Cairo's Abdeen Palace. His father, Mahmoud, taught him the trade and now he teaches the craft to his son Mustafa. It is a profession often looked down upon in Egyptian society. Mustafa works with the beasts of burden that still roam modern Cairo's streets, pulling carts filled with vegetables or loads of trash from neighborhoods. But workers rely on the animals and take pride in them, getting them haircuts or having their fur shaved with designs or even their initials ahead of major holidays. "There are a lot of other people who do this job. But he (Mohamed) is gentle and his prices are gentle too," says Abdulrahman Ibrahim, a cart driver who stopped by Mohamed's outdoor shop to get his horse's monthly trim. Mohamed charges between 20 and 30 Egyptian pounds ($3 to $5) per customer. Each appointment takes him less than 30 minutes to finish, depending on the order, and the animal's sensitivities. "All the horses are clever. 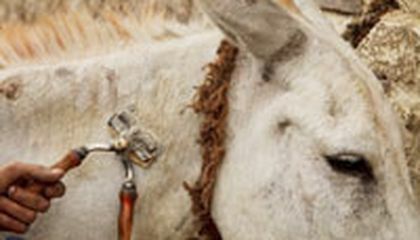 In fact all the donkeys, cows and dogs are clever. Without a doubt, dogs will slip out from under you," he says. But the work is dangerous. Later in his family's one-room home, Mohamed traces to a scar across his right jaw with a finger missing its first joint. "One horse bit my finger off, another horse hit me here," Mohamed says, pointing to a scar on his jaw visible through a thick beard. Despite that, Mohamed takes pride in his work. "People love us because they trust the quality of work between us," he says. "They loved my father, and my work is like my father's work."